Flying Fibers focuses on premium, breed-specific, British and American fibers and yarns. Why British Fibers and Yarns? Well, to make a long story short, Jeri met Matthew, an Englishman from Yorkshire in the winter of 1987. On her first trip to visit him later that year, she fell in love with all the sheep and wool that she saw. Sheep were everywhere and wool was in full fashion. Jump to today and in an effort to create a niche in the fiber arts market, Jeri, Matthew, and their daughter, Irina, decided to focus on the British fibers and the companies that they love so much. We currently carry products from West Yorkshire Spinners, Doulton Border Leicester Flock, Fyberspates, Hedgehog Fibres, TOFT UK, and Wensleydale Longwool SheepShop Yarns. Why American Fibers and Yarns? The simple answer to this question is that we want to help keep the fiber growing and processing community alive in the United States. As shepherds ourselves, we appreciate what it takes to bring wool to the masses. 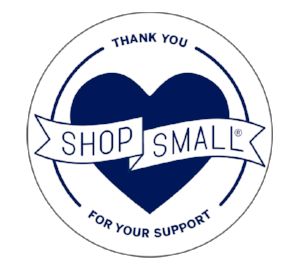 Therefore, we support North American companies such as Brooklyn Tweed, Quince & Co., and more! You will also find products from Jeri and Irina’s own flock of rare breed British sheep. Additionally, it is our goal to provide the handspinner and felter with the largest selection of roving in Central Pennsylvania. Spinning and Weaving equipment and supplies are available and in stock including products from Ashford, Louet, Schacht, Majacraft and Kromski. Located in scenic Lancaster County, Pennsylvania, we are just minutes from Park City Mall in Lancaster, Spooky Nook Sports in Manheim, and an easy drive from the Elizabethtown, Hershey, Harrisburg and Lebanon areas. 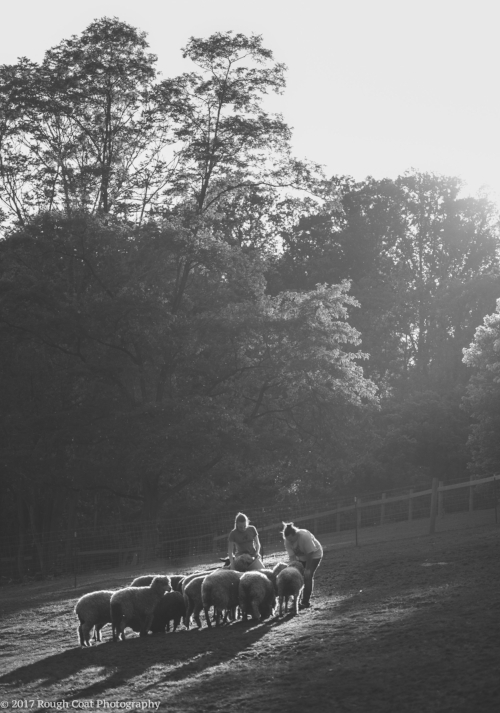 Jeri Robinson-Lawrence (right) and Irina Lawrence (left) with their sheep on their farm in York County, PA.
Photo credit to Valerie Buller of Rough Coat Photography, 2017. Jeri with her flock of sheep around her at feeding time. 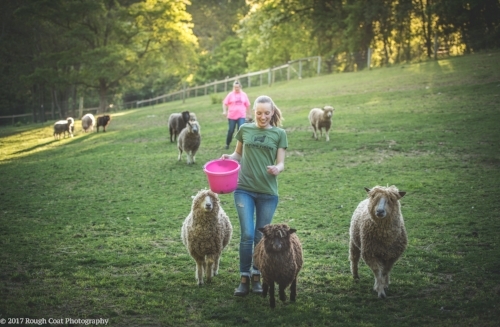 Irina at feeding time with Primrose, Sir Clive, and Timi, the longwool sheep by her side. Flying Fibers is brought to you by the mother-daughter team of Jeri Robinson-Lawrence and Irina Lawrence. They honor and celebrate diversity and inclusion while welcoming everyone to their little corner of the world. Both women are passionate about providing beautiful products to crafters of any skill, as well as promoting the preservation of rare breed sheep. 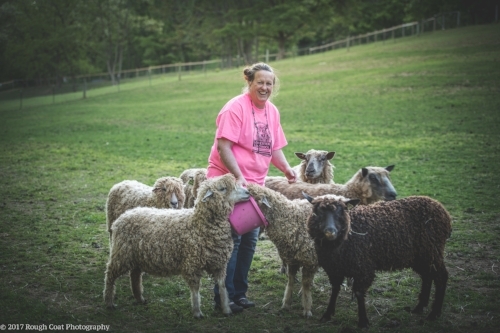 In addition to owning the shop, Jeri and Irina have a flock of rare breed Wensleydale sheep, endangered Leicester Longwool sheep, rare breed Shetland sheep and rare breed Teeswater sheep that they raise on their farm in York County. Based on the season, this local fiber is available in-store and online. These two women are extremely passionate about the fiber arts and are regularly willing to share their knowledge and expertise with whoever desires. Jeri is primarily behind-the-scenes with Irina being present in the shop. Although young in appearance, Irina has extensive knowledge of the fiber arts having begun her journey at the age of six, and can tackle your most challenging of needs. Evenings: We are open until 8pm, on the 2nd and 4th Wednesdays of each month. Please note we are closed for New Years Day (Jan 1), Memorial Day, July 4th, Labor Day, Thanksgiving, and Christmas Day. Check our Facebook for unexpected closings. Want more updates? Sign up for our newsletter! Click here.